It’s Wednesday night and I actually stayed home from knit night at the store – just a little too tired and in need of a stay at home day. 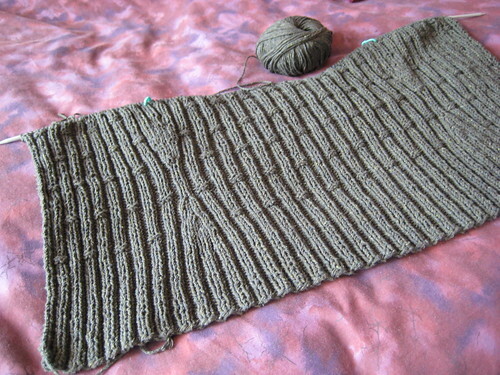 I’ve been working on a new cardigan the last week or so, in bamboo rib and Estelle 100% silk. Now I’m just hoping I have enough yarn! I bought ten balls, a sleeve to the underarm took about 1.5 balls (so three for both) and the body a little more than three, so I’ve got three more for the yoke and collar. Probably won’t be the longest collar at that yardage, but not too bad. It should be okay. 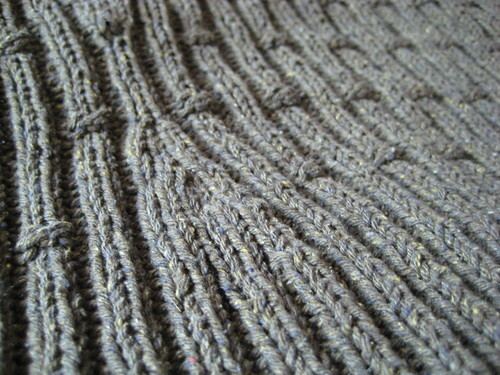 Oh, and the yarn is actually green – I didn’t fiddle with the photos so it looks all grey or brown or something. I love the flow of the waist shaping. I am stuck on several projects – that kind of stuck where I work hard to get back into a pattern, correct the problem, knit on cleanly for a few rows and then make another error and have to rip back again! How pleasant this morning to have your blog open and see a shot of such lovely progress from just last night! Thank you! Very nice pattern! 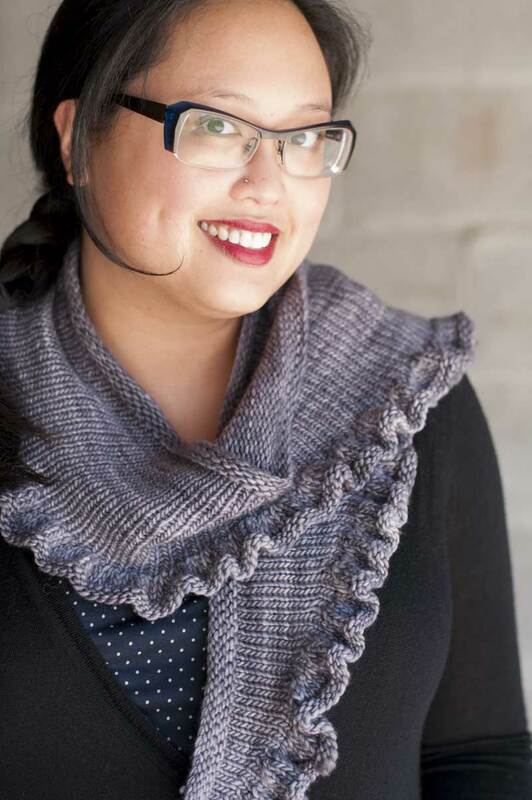 I found your site by googling Must Have Cardigan images…I’m just starting to knit that sweater. BTW, yours was very lovely in the chestnut color! I can’t wait to see it finished. Love that bamboo ribbing. Gorgeous job – love the ribbing ! Which colour was it I may have more!!! That is lovely, so far! The waist shaping/accents are ingenious. Can’t wait to see the color–I love green. Yum! And belated Congratulations on graduating. Grown-up jobs are vastly over-rated. i have never seen bamboo rib before, its beautiful! Great looking pattern. I did an Ariann in Estelle silk, and used six balls less than I thought it would take! It is one of my favorite sweaters. The only thing I don’t love is that the silk has a really strong smell that gets stronger with wear and in the heat. People have actually commented on it. I’ve washed it three times, which has made no difference. I love that bamboo rib- I’ve never seen it either. The cardi is going to be beautiful! Oh I just love that rib and the waist shaping- is this a pattern you are creating or someone else’s design? I would love to know so I can make one too!